A discipline that has been widespread in direct response advertising, yet flies under the radar of the mainstream, is the use of psychology-based copywriting. Words have the power to create emotions, motivate and inspire, instill fear and, as we’ll examine closely in this post, persuade. At the end of this post, I’ll show you how you can leverage these facts for more effective ad copy because of the psychological principles at work. 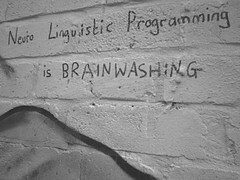 Without getting too technical, Neuro-Linguistic Programming (NLP) is a “quasi-science” that has stirred up its share of controversy over the years, but has undeniably influenced and been studied by top advertising copywriters, as well as other master influencers because of its remarkable effectiveness. This would include Tony Robbins, who began his coaching career as an NLP practitioner and trainer alongside NLP co-creator, John Grinder. Since I have a 700-page book on NLP techniques in my collection, I won’t pretend it is a simple topic, but to sum up the premise of NLP in a nutshell, it’s that language is hard-wired to our thoughts, emotions, habits and behaviors. With that understanding, language has the power to influence thoughts, conscious and unconscious, as well as behavior and habits… truly powerful stuff, when you stop and imagine the potential and ask yourself how your business could transform if your messages had such ability to persuade, inspire and motivate to action. Let’s explore a few simple “power words” and see how you can effectively apply them to your marketing or management messages. Have you ever given someone praise, but followed it up with a negative (or constructive) comment and the person walked away focusing not on the praise, but instead holding the negative much more closely than you intended? The board seemed to be engaged by your presentation, but there were mistakes in the slides. There were mistakes in the slides, but the board seemed to be engaged by your presentation. When delivering a message where you want multiple pieces to be considered and tied together, combat the delete-like effect of the word “but” by using the word “and” instead. This acts to tie the two concepts together and allows you to add a follow on. The board seemed to be engaged by your presentation and there were some mistakes in the slides, so we have an opportunity to further strengthen our position. The board seemed distracted by your presentation and there were mistakes in the slides, yet I received seven follow up emails with detailed questions and they want to have a follow up meeting to discuss further. The word “because” allows you to link two ideas and imply that one idea caused another. The board seemed distracted by your presentation because there were mistakes in the slides. Notice that through this progression, the meaning of these sentences, although some variations are similar, significantly change when we use our simple power words? This is just the tip of the iceberg, as far as using simple “power words” thoughtfully placed to communicate more effectively. Just keep in mind that with great power comes great responsibility, as Uncle Ben once told a young Spider-man. Persuasion and influence tactics should be used carefully and ethically.